It was a telling comment from earlier this week — one that proved prescient on Saturday in the final round of the inaugural Augusta National Women’s Amateur. On Monday, Jennifer Kupcho had just been announced by the CGA as one of two recipients of the Hale Irwin Medal, along with Dale Douglass. The lifelong Coloradan was asked what attributes she shares with Irwin, the World Golf Hall of Famer who grew in Boulder. “Being as good a player as he is, probably one of the biggest things is the grit he has on the golf course,” Kupcho said of Irwin. “He probably never quit, never gave up. And I think that’s one of my strongest qualities when it comes to being on the golf course. You always have to come back strong” no matter the adversity. And that quality was on full display during the stretch run Saturday at historic Augusta National Golf Club in Georgia. Kupcho certainly faced some adversity after battling a migraine headache, losing the lead she took into the final round and trailing Mexico’s Maria Fassi by two after 12 holes. But that’s where Kupcho’s never-say-die attitude came to the fore as she hit her second shot on the famous par-5 13th hole to 6 feet and she drained that for eagle, which moved her back into a share of the lead. Then after Fassi, the 2017-18 women’s college player of the year at Arkansas, regained the top spot outright with a 15-foot birdie on 14, Kupcho was back at it again on the par-5 15th. After a drive on the left side of the fairway, the Wake Forest senior hit a big draw around trees that were between her and the pin and her ball trickled just over the back edge of the green. From there, she two-putted from 18 feet for birdie. After hitting her drive well right, Fassi salvaged a par from 6 feet to leave them tied again. Kupcho set herself apart on the par-3 16th, spinning her tee shot back 10 feet under the hole and draining the birdie putt with a fist pump. And when Fassi three-putted, the Coloradan owned a two-stroke lead. A par on 17 and a 25-foot birdie on 18 later, Kupcho could call herself the first winner of the Augusta National Women’s Amateur. Kupcho played her final six holes in 5 under par to shoot a 5-under 67, Saturday’s low round by two strokes. That gave her a 10-under 206 total and a four-stroke victory over Fassi, a friendly rival she has known since the two were teenagers competing in Colorado at USGA championship qualifiers. What made the story even more remarkable was that Kupcho revealed afterward in Butler Cabin that she was struck with a migraine headache mid-round. “I actually got a migraine on the eighth green,” she said. “From here over to the left, I just couldn’t see. It was blurry. I told my caddie, ‘Look, I’m looking for you to read the putts. Tell me where to hit it and I’ll do my best to hit it there. It didn’t hurt that Kupcho’s Saturday caddie was an Augusta National looper, Brian Murphy, who also caddied for her two years ago when she first played the course. — She’s been the No. 1-ranked women’s amateur in the world for 26 weeks. — She won the NCAA Division I individual title a year after finishing runner-up. She became the first Colorado woman to capture that national championship. — She’s chalked up five of her nine overall college titles. And she’s gone first-first in her last two college events. — She finished second out of 102 players in the eight-round LPGA Q-Series in the fall, easily earning her LPGA Tour card, which she’ll accept after concluding her college career in May. — She represented U.S. on winning teams at Curtis Cup, Arnold Palmer Cup and women’s World Amateur Team Championship (2018), finishing second individually in the world event. — She finished LPGA Tour career-best 16th in LPGA Marathon Classic (2018). — She became the first American woman to win the prestigious Mark H. McCormack Medal as the top women’s player in the World Amateur Golf Rankings as of the conclusion of 2018 U.S. Women’s Amateur. — She was named world’s top female amateur golfer of 2018 by Global Golf Post. 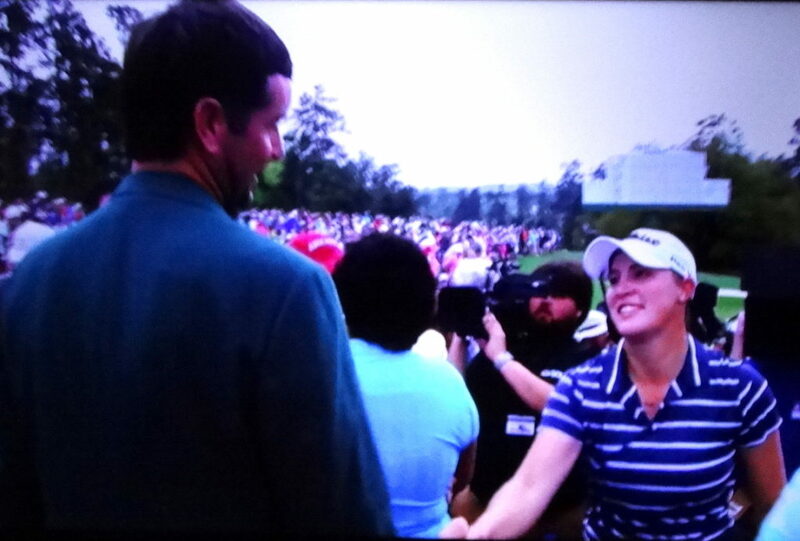 Jennifer Kupcho is congratulated on Saturday by two-time Masters champion Bubba Watson. On Saturday, things weren’t looking very promising for Kupcho in the middle of Saturday’s round — about when her migraine hit. She led by one after making a 1-foot birdie on No. 6 on Saturday, but Fassi birdied the next two holes — from 1 foot and 6 inches — to grab the top spot for the first time in the final round. Despite a first-hole bogey, Fassi shot a 3-under 33 on the front nine. Then Kupcho three-putted for bogey on No. 10, missing a 2-foot par attempt. With that, Fassi had picked up three strokes on Kupcho in the course of four holes, going from one behind to two in the lead. Then Fassi scrambled to save par from 12 feet on the par-3 12th after hitting her tee shot in the front sand and barely getting her second shot over the lip of the bunker. But that’s where Kupcho’s amazing run started. Over her final six holes, she went eagle, par, birdie, birdie, par, birdie. The two hybrids she hit for second shots into the par-5s — Nos. 13 and 15 — were two of the biggest keys. To start off Saturday’s action at Augusta National, World Golf Hall of Famers Nancy Lopez, Annika Sorenstam, Se Ri Pak and Lorena Ochoa hit honorary tee shots as part of ANWA’s first tee ceremony — not unlike what Jack Nicklaus and Gary Player will do ahead of the Masters on Thursday. After the round, the four LPGA legends were among the many who congratulated Kupcho as she walked off the 18th green, along with two-time Masters champion Bubba Watson and — of course — Kupcho’s family: dad Mike, mother Janet and brother Steven. It was a perfect ending to a big week for Kupcho. As noted above, on Monday she was announced as one of the first two recipients of the Hale Irwin Medal, which recognizes outstanding Colorado golfers who exhibit competitiveness, resiliency and a proven record of winning. Then on Wednesday night, Kupcho was honored as the 2018 Amateur Athlete of the Year — regardless of sport or gender — by the Colorado Sports Hall of Fame. For all the scores from the ANWA, CLICK HERE. For a look at what Kupcho has accomplished in her career in Colorado and elsewhere, CLICK HERE.